We are happy to reveal a new Rocket release by Temple Ov BBV – a special collaboration between Gnod and Radar Men from the Moon. In 1965 the Dutch scientist and psychedelic pioneer Bart Huges embarked on a personal journey by taking an electric dentist’s drill and using it to open a hole in his skull, theorising that this measure - known as trepanation and chronicled in this book ‘The Mechanics Of Brain Blood Volume (BBV) - would result in enhanced mental power, and in effect a permanent high for the owner of the skull in question. 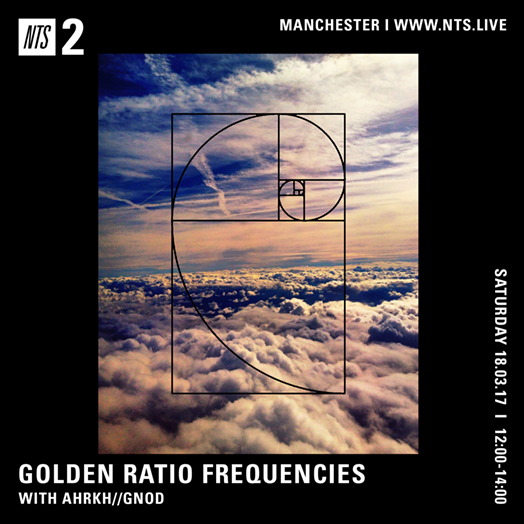 Fifty-one years on, in 2016, this act formed an inspiration for a meeting of mind and matter on an entirely different level, as Salford’s imperious collective Gnod locked horns for a collaboration with Dutch psychedelic and experimental force Radar Men From The Moon, also originally set to take place in the Netherlands, at Eindhoven Psych Lab. 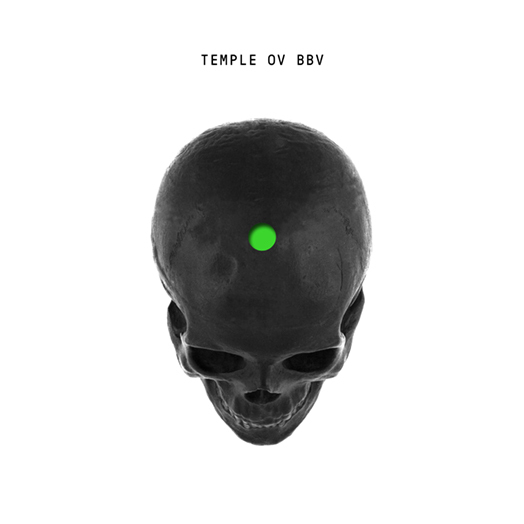 Powerful testimony to the expansive and exploratory nature of both bands, ‘Temple Of BBV’ is a radical foray into the unknown that exists firmly outside of genre or classification. Aptly, the set will be performed once again as part of Gnod’s residency at this years Roadburn Festival. The collaboration maps out intimidating psychic landscapes that revel in challenge and confrontation, and appear set to enter the skulls of the uninitiated by any means necessary. There will be many howls, and here’s one of the first out of the blocks. Gnod can meander, at times (and I like their meanderings), but here the rage is palpable; this is a headbutt into the side of a fast-moving machine. Hawkwind on double-speed, ditching the mushrooms for Brown Acid and amphetamania. I mean, it’s not all like this – but the album is dominated by riffs; monstrous and head-shaking and world-annihilating as they are. This is still psych music, but veiled in exasperation and threat; psych music that is distinctly unhinged and hanging on a thread. 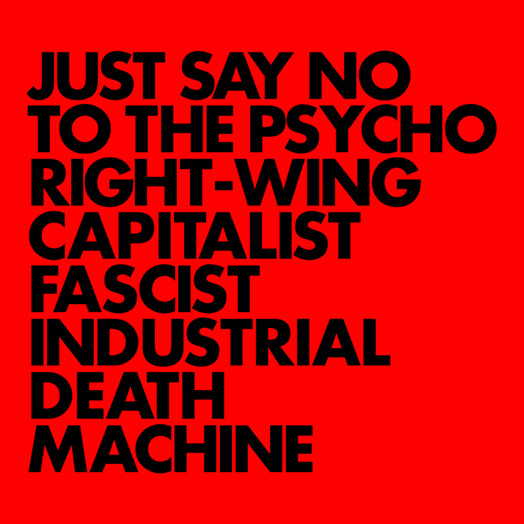 Today sees the release of 'Just Say No To The Psycho Right-Wing Capitalist Fascist Industrial Death Machine' the stunning new album by GNOD. 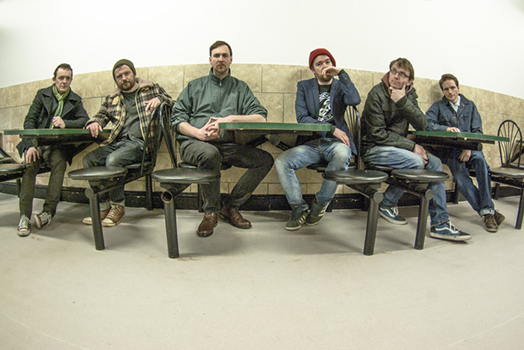 We are delighted to annouce that GOAT are to play this years WOMAD Festival. Rocket have never been to WOMAD to should be something different. WOMAD 2017 takes place 27th – 30th July at Charlton Park near Malmesbury. We are making some ltd tshirts that you can preorder today. 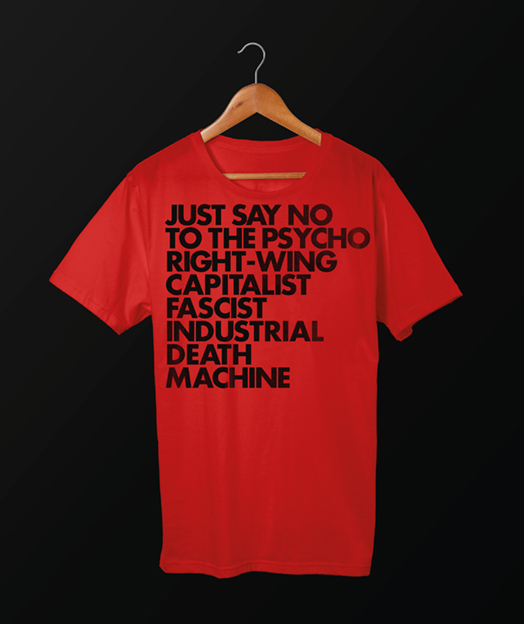 First up is a Gnod – Just Say No To The Psycho Right-Wing Capitalist Fascist Industrial Death Machine shirt printed black on red. 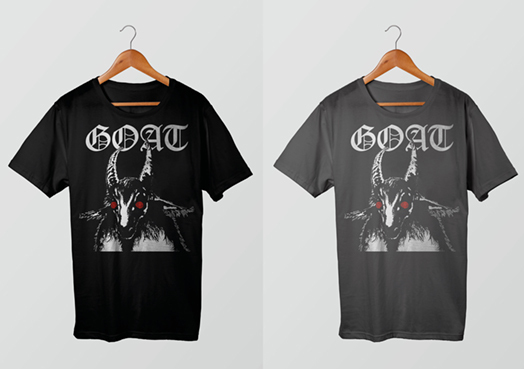 Second is the extremely popular Goatman tshirt, white/red prints onto Black and Dark Heather (a dark grey marl) shirts. On May 11th our very own Whyte Horses descend on the Barbican Centre bringing their unique brand of Mancunian psychedelic pop and head-spinning visual collages in a rare live appearance. 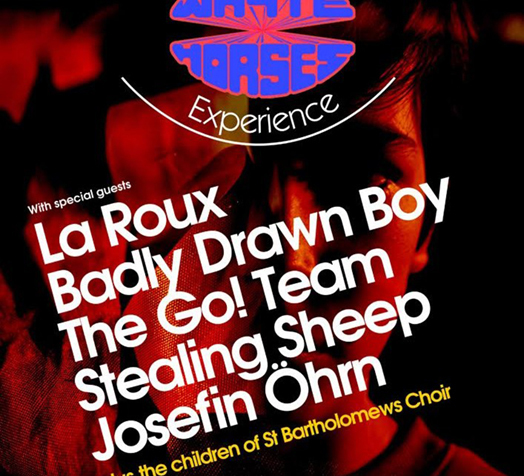 Now added to the bill are La Roux Stealing Sheep and the children of St. Barts Choir. The evening will see a full performance of their 2016 debut album Pop or Not, with previously announced special guest artists the go! 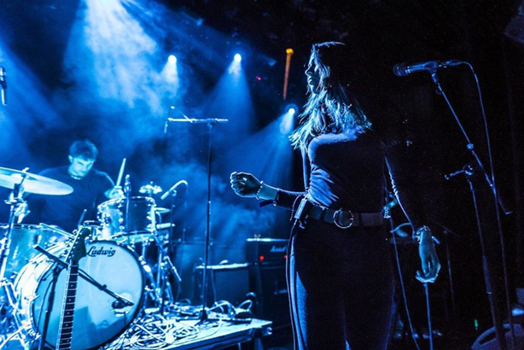 team BadlyDrawnBoy Official and Josefin Öhrn + The Liberation also taking up vocal duties on unheard songs and cover versions of obscure world oddities. 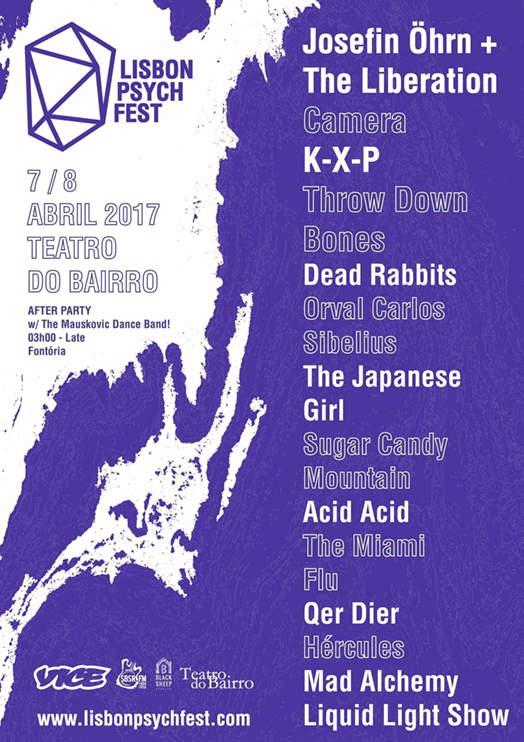 We are extremely proud to announce that Pigs Pigs Pigs Pigs Pigs Pigs Pigs and Flowers Must die are to join KURO and GNOD (Anonymous Bash) at this years Supersonic Festival. 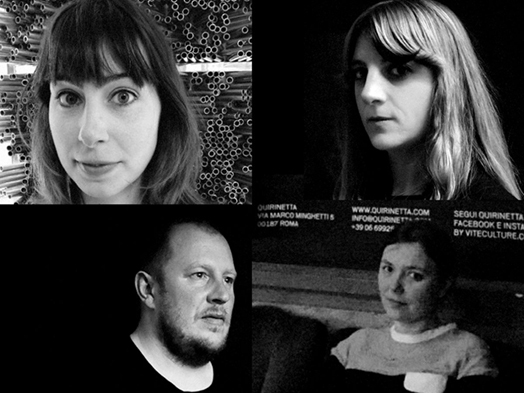 What has the Velvet Underground & Nico meant for you and how has it inspired your own work? It has meant everything, most music that we’ve related to can be traced to Velvet, not only musically then lyrically and as a perspective on the world. It was Velvet that we bonded when we first met, before we started writing together. Why did the album/band intrigue you in the first place? I think the contrast between beauty and brute noise, of lullaby and rock’n’roll, I was just a child when I heard “Sunday Morning,” “Waiting For the Man” and “Run Run Run” and loved them without having a clue to what they were about. Then I was really into Celine and Genet and that just tied in with Velvet’s music without really understanding why. These beautiful, menacing beings that seem to occupy a terrifying world that is just where I wanted to live. I was absolutely absorbed when I first heard it. And who doesn’t want to look like Nico, John Cale or Lou Reed in 1967 or all three? How do you consider their debut album 50 years down the road? Goes without saying that it’s a masterpiece – and it’s scary how it seems to just change into something relevant and new for each period that passes. Seeing the sun rise in Andalucía after a really really long drive with White Light/White Heat on repeat. 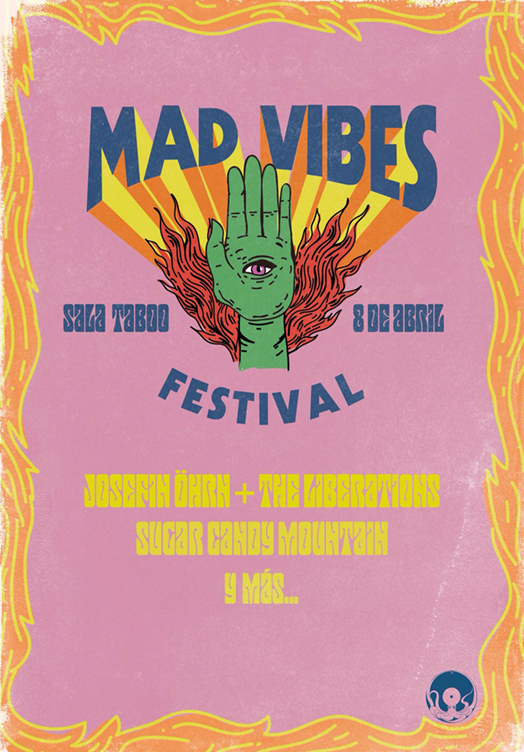 The night before Mad Vibes on 7 April Josefin Öhrn + The Liberation are headlining a great line-up at Lisbon Psych Festival. Who puts a run of classic albums together these days? The sort of thing that Stevie Wonder, David Bowie or Neil Young would do in the 70s. A little sprint of three or four, 9 or 10 rated albums in as many years. Gnod are doing it right now with Infinity Machines, Mirror and Just Say No To The Psycho Right-Wing Capitalist Fascist Industrial Death Machine. And, like Young or Bowie in the 70s, you don't know what they're going to do next. 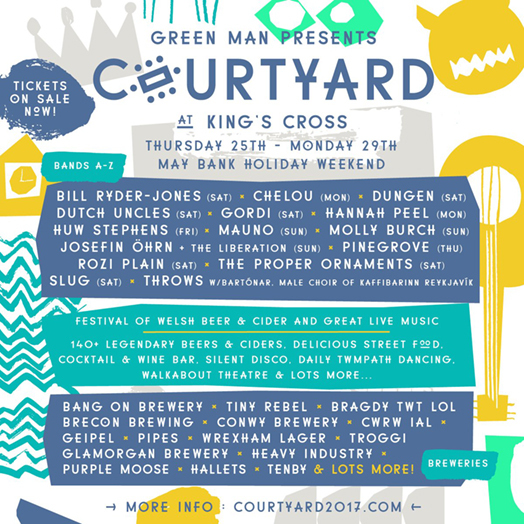 Josefin Öhrn + The Liberation have been confirmed to play Greenman's Courtyard mini festival in Kings Cross at the end of May. 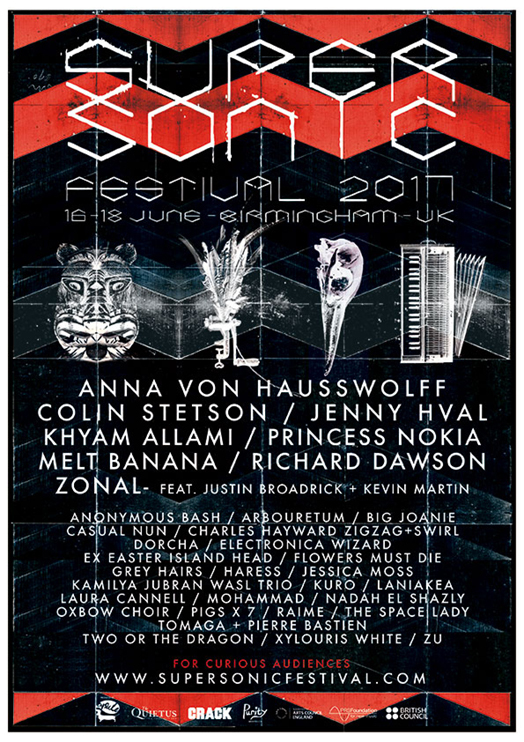 They are playing the same day as fellow Swedes Dungen...gonna be a bit special!! Russian band Gnoomes return with their second album on Rocket Recordings, playing their on brand of what they call ‘Stargaze’. I wrote about their first album on these pages , and it reached the semi finals of my Best of 2015, only being knock out by eventual winners Dead Sea Apes . The obvious thing would be to compare this album to the high standards of their debut. After a few listens I think this would be a little unfair so, all I’m going to say is that this album seems far more expansive. To celebrate the days getting longer and the sun (hopefully) shining brighter we have decided to do a 'one week spring sale' where you can buy all Rocket releases at an amazing 25% off. The sale starts from now and end at midnight on Wednesday the 29th March. We have had some warehouse finds at our distributor, and have put them up on the shop, so releases that have not been available for a while are also available with 25% off . We are excited to announce the release of a new special ltd edition 7” for Record Store Day by Goat. 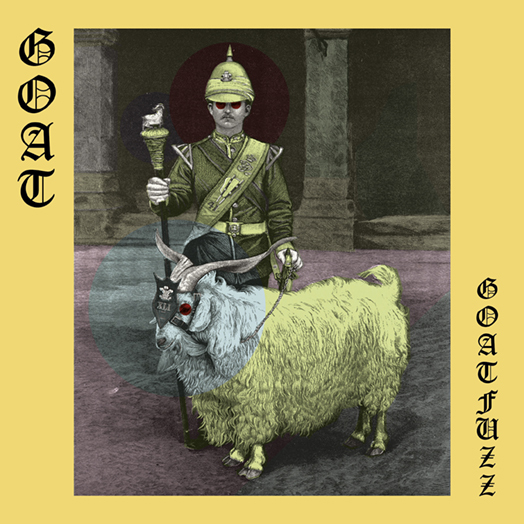 The single is a previously unreleased version of Goatfuzz – one of the stand out tracks off their latest album Requiem. Goatfuzz’s heavy-groove and addictive fuzz riff became a firm live favourite on last years European tour and summer festival appearances and this 'shorter' version is perfect for the 7” format. We are also pleased to reveal that the b-side of the 7” is a brand new, unreleased track called Goatfizz. The tracks spaced out, psych sounds are underpinned by a killer repetitive drum and bass groove. The end result reveals another unique take on ‘world music’ by Goat. The two colour ‘splatter vinyl’ 7” is ltd to 2,000 copies worldwide (500 for the UK). 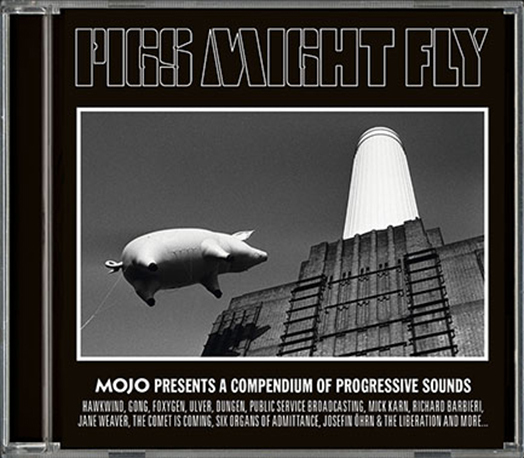 If you pick-up the latest issue of Mojo with Pink Floyd on the cover you will be greeted by tracks from Julie's Haircut and Josefin Öhrn + The Liberation on the cover mount CD. Independent in an independent musical environment. This is the status of the italian band Julie’s Haircut, active since 1994, who never wanted to be captured in a specific scene. That’s why they usually hang out at international circuits and you cannot recognize their italian origins, except from a delicate attention to melodies. 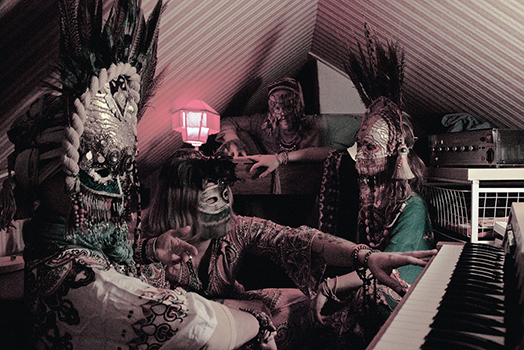 This is the premise for their seventh album, Invocation and Ritual Dance of My Demon Twin, out now for the British label Rocket Recordings, in which you will find their personal interpretation of psychedelia, a soft and meditative one. This interpretation is nourished by post rock rides, without the typical explosions of the genre. 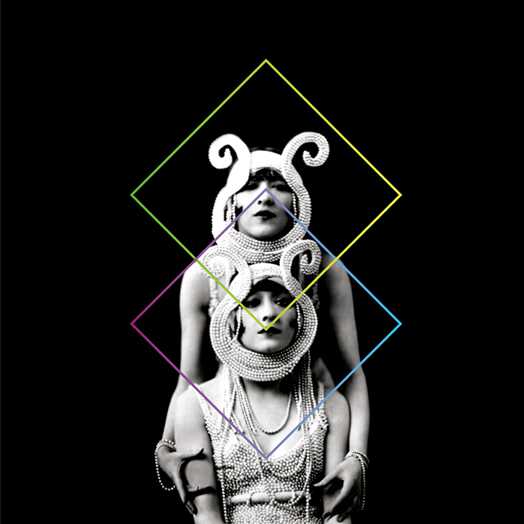 So this album is to be listened as a good synthesis of post rock and psych sound. Bass vapors introduce the quietness of “Zukunft”, from the solemn gait of a delicate electric piano to the incipit of a tense drum which opens the second part of the song, in which noise and a far sax duet. An episode like “The Fire Sermon” offers an intimate journey in which drums lead the dance. “Orpheus Rising” is delicate with its twist of trumpet, guitar, bass and drumming. “Deluge” in the beginning is a hard psych track, with a shouting sax in evidence, while suddenly the music stops leaving empty floydian spaces brushed by a warm trumpet. At the end the song explodes in a volcano of distorted guitars. Some other tracks offer a more psychedelic side of the band, but the real plus of this album is its attitude to offer a wide range of trips to the listener. You will not fall in love with this music because it is not made for emotional involvement, it is a music for brain and reflections, to abandon oneself to the flow. 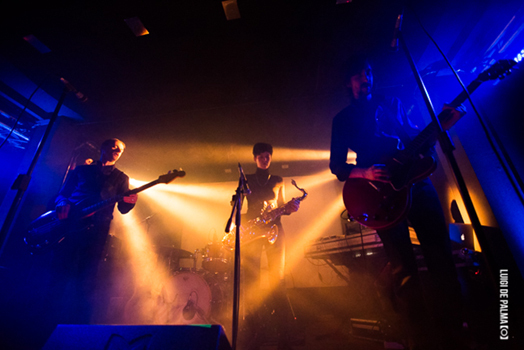 These days the word psychedelic gets thrown against pretty much anything with a guitar but this is the real deal right here – the new set from Sweden’s Hills in the shape of their titanic Alive At Roadburn. Four sides, four songs, each one clocking in at over 13 minutes and built on hypnotic grooves, spiralling guitars and all sorts of magic only some can do…and Hills are the band to beat. There’s limited colour vinyl out there. God bless Rocket. 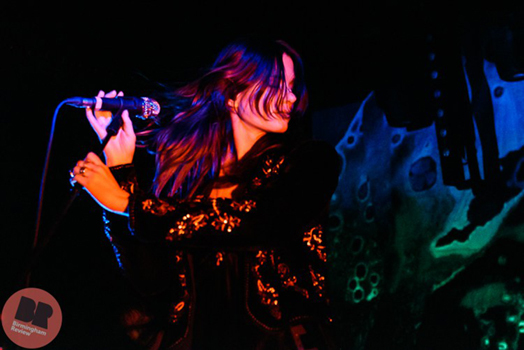 Here's a great gallery of photos by Birmingham Review of Josefin Öhrn + The Liberation live at the Hare & Hounds. If we can trust our senses anymore, we’d say the longest and most intense set was of the headlining act KURO. 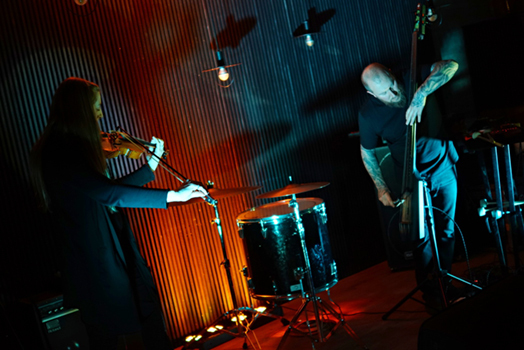 Mostly using electric contrabass and violin and sometimes other electronics as well, the duo started off with a repeated dark motif. The next couple of minutes saw a series of layered lines over that motif, alternating with calmer phrases that sonically seemed to represent Asian deserts. With the projected spiralling background, KURO attempted to first hypnotise the audience and once that was done, torture their captives. What a delight! The night came to an end to a unanimous satisfaction of seeing something exciting, unique and truly brave and immersive. Hopefully, this is one the many successful adventures that will take place under the banner of New Music for Old Machines. Flourishing where sparks fly between primal rock brawn and artrock grace, Hey Colossus have undergone a spectacular metamorphosis in the last three years. Previously famed for their unflinchingly abject and pulverising noiserock assaults, the 2015 Rocket Recordings double-drop of In Black And Gold and Radio Static High displayed not only a band with a work rate to put most all their contemporaries to shame, but one arriving at an atmospheric and rewarding sound with as much flair for the beguiling as the barbaric – within these grooves were everything from Amphetamine Reptile swagger to Bad Seeds drama, dub dynamics to krautrock repetition, yet all in a coherent assault that transcended the sum of its parts with depraved style and graceful finesse. 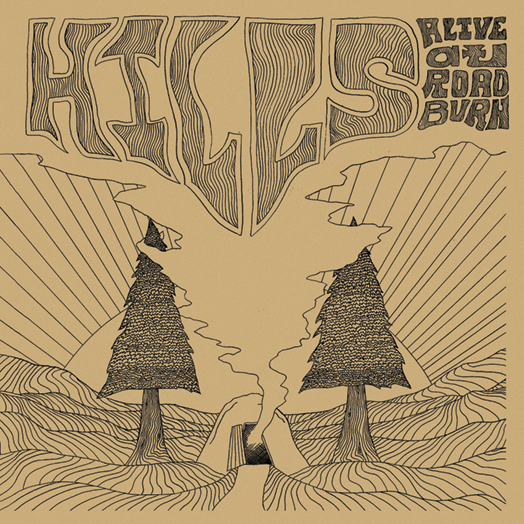 Today sees the release of Hills – Alive at Roadburn on 2LP, CD and DL. The band are currently in the studio writing the follow up to their highly acclaimed last album Frid. 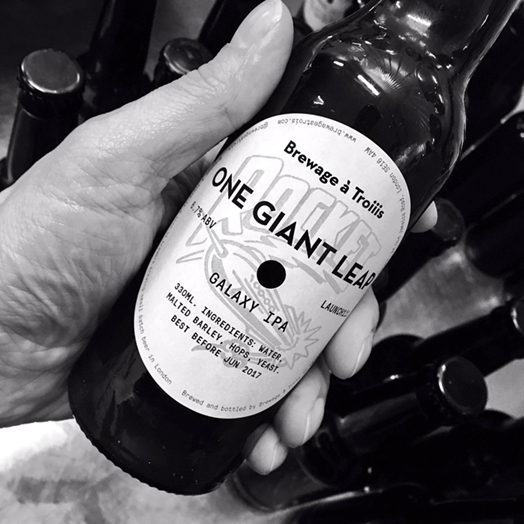 The lovely people at Salthouse Bottle shop in Brockley in London are stocking the latest batch of Rocket's 'One Giant Leap' IPA – brewed by Brewage A Trois. Salthouse Bottles came across it at the Stoke Newington Beer Festival and were impressed by it enough to want to stock it! So, get yourselves down there and pick up a bottle or 5! This new video for ‘After Gong’ is the second release from the forthcoming Flowers Must Die album ‘Kompost’, due to be released on 28th April via Rocket Recordings. I’m sure we can all agree it’s a fitting tribute for a band to honour the memory of a fallen friend by dedicating a song to them. 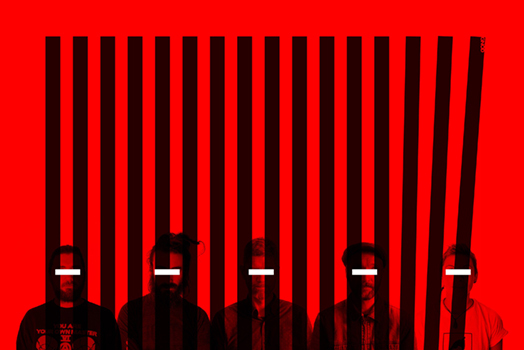 This new track does exactly that as band member Rickard Daun explains. “The track originally had the working title ’Efter Maten’ (After Dinner), but we changed it to ‘After Gong’ to pay tribute to Gilli Smyth. The Gong member who died of pneumonia around the time when we would name the song”. 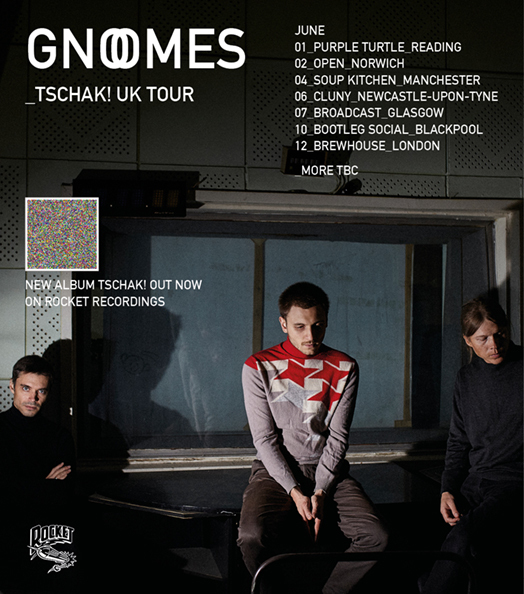 Gnod are a punk infused psych krautrock collective hailing from Salford, Greater Manchester. 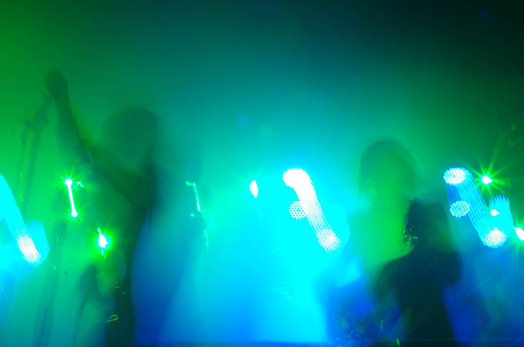 Having formed in 2006 they have become an institution in their own right and are essentially a collective with a rotating list of musicians who frequent art-hub Islington Mill. 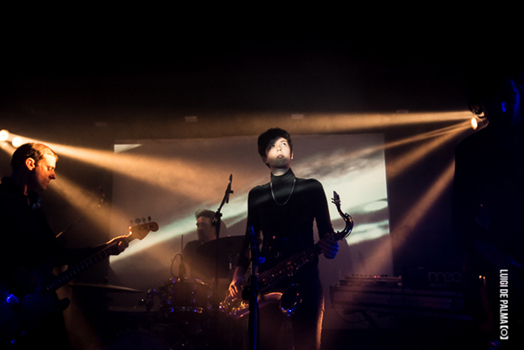 With an impressive back catalogue under their belt they have garnered an increasing amount of attention to their cause, in particular of note are albums Ingnodwetrust (2011), Infinity Machines (2015) and Mirror (2016) as well as collaborative efforts, most notably Drop Out with White Hills II (2010). 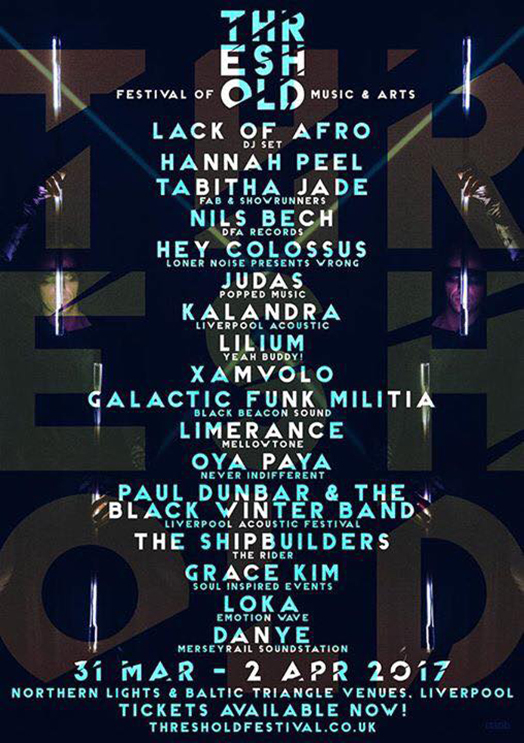 Excited to announce KURO will be playing a very special collaborative set at this years Supersonic Festival. 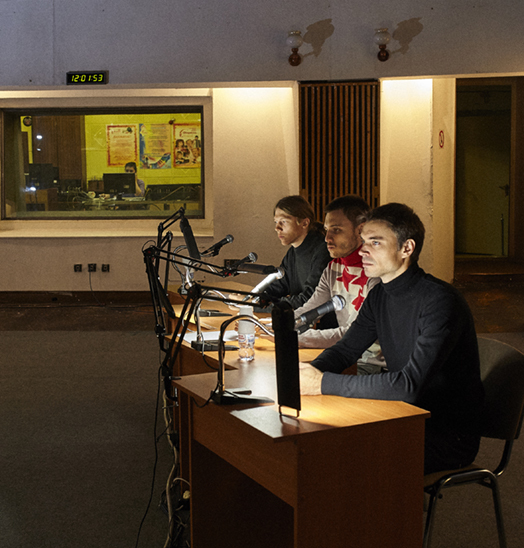 Kuro feature the amplified talents of French violinist Agathe Max and bassist Gareth Turner, joined by Valentina Magaletti of Tomaga (drums) and Helen Papaioannou (baritone sax) for this Superspecial Supersonic performance. 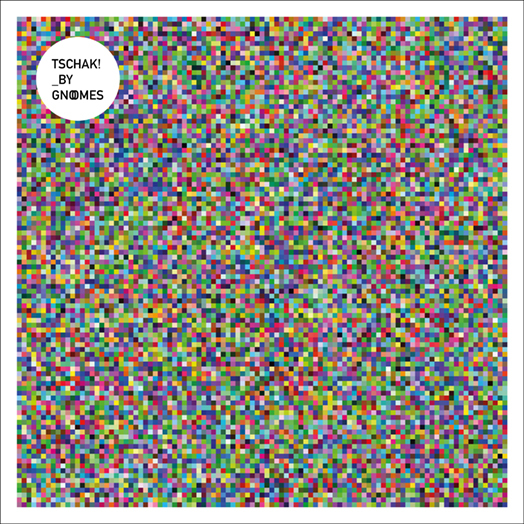 Echoes and Dust reviews Gnoomes album Tschak!